In 1987, the Phycological Society of America established the Hannah T. Croasdale Endowment Fund. Income generated by the fund's endowment supports the Croasdale Fellowship program. This program is designed to encourage graduate students to broaden their phycological training by attending phycology courses at biological field stations. To that end, financial assistance is provided. Eligibility: Applicants must be members of PSA. They must be currently enrolled in a graduate program or formally admitted at the time of the submission of the application. Awards: Fellowship awards are made in the amount of up to $1,500 and are intended to defray costs incurred in taking the course: tuition, travel, room and board. Awards are made directly to the student. The purpose of the award is to broaden phycological training, not necessarily to further research goals. Fellowship support for attending technique courses may be requested from the Grants-in Aid Research Program. Evaluation and Selection: Selection of recipients will be based on the overall merit and need of the applicant. These qualities will be judged from information provided in the completed application, transcripts, and a letter of recommendation from the applicant's major professor. Applications will be evaluated by the members of the PSA Grants and Fellowships Committee, and will be notified of the committee's decision as soon as it is available. Application Procedure: To be eligible for consideration, send one (1) electronic copy (Adobe Acrobat format preferred) of all application materials to Sophie McCoy on or before March 1st. The applicant must complete the application (below). A copy of her/his transcript (unofficial copies are acceptable) must be submitted. The student must request a short letter of recommendation from his/her major advisor. Please have your advisor submit only one (1) copy of this letter to Sophie McCoy. The March 1 deadline also applies to the letter of recommendation. Applications and questions should be directed to Sophie McCoy. Successfully Funded Students: Students given awards will be required to submit 4 separate items. 1) A final report (1 page) that indicates the activity/course and how it benefited the student's education. 2) The student will be required to provide financial accounting (with receipts). 3) The student will be asked to provide a photograph of themself doing something professional and meaningful (e.g., learning about algal diversity at the beach). 4) A short paragraph of what the student did with the PSA funding suitable for posting on the PSA Website. All of these items should be submitted to Dan Thornton as soon as possible. NOTE: Your application must include all items below, and you must insure that the complete application, including the letter of recommendation is received by the application deadline. Incomplete applications, in part or whole, received after the deadline will NOT be reviewed. Briefly explain (justify) how attending this course will contribute to your educational and professional development and goals. Describe the proposed course, including the name and address of the field station where the course is offered. List the course title, number, credits, and the beginning and end dates. List expenses associated with attending this course. What specific expenses will be defrayed by the fellowship? List types and amounts of other support, including that from your institution and your personal funds available to support your attendance in this course. During the Friday Harbor Labs Marine Algae field course, I observed the diversity of marine algae on San Juan Island across a wide range of habitats, including Eagle Cove, San Juan Island, WA. The Croasdale Fellowship Award offset tuition cost for me to attend the Friday Harbor Labs Marine Algae summer course in the summer of 2013. This course was my first formal introduction to the marine algae of the Pacific Northwest and was pivotal in helping me to begin my graduate research in phycology. The course included field trips for collecting and identifying algae in situ, and it offered laboratory instruction for state-of-the-art methods for identifying algae species. We learned to use light microscopy, scanning electron microscopy, DNA extraction techniques, and phylogenetic analysis to identify cryptic species of algae to the species level. These skills were put to use during the course on a research project that addressed an existing research question in phycology for identifying cryptic Ulva species on San Juan Island, WA. 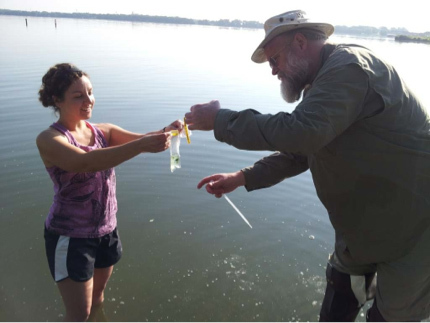 Dawn modeling the turkey baster used to take an epilithic diatom sample at Spirit Lake, Iowa. I used the funding from the Hannah T. Croasdale Fellowship to help pay for the tuition for two courses at Iowa Lakeside Laboratory this summer. I took the Ecology and Systematics of Diatoms course and Freshwater Algae course. Both courses were intensive with field and lab components. I learned various ways to sample diatoms and algae in habitats such as rivers, lakes, ponds, and fens. I learned how to identify diatoms down to species, and over 100 algal genera. The lectures for both courses helped me to understand the diversity and ecology of all algal groups. Both courses will be highly beneficial to my work in Alaskan peat lands for my Master’s project. I am studying algal community composition across three different plots of varying water level during the entirety of the growing season in Alaska. Sylvia sampling a bloom of Aphanizomenon in Silver Lake, Iowa. The Hannah T. Croasdale Fellowship allowed me to take the Freshwater Algae course at the Iowa Lakeside Laboratory. The class took field collections from diverse habitats and studied algal morphology and taxonomy in the laboratory. Because my dissertation work is focused on diatoms, I had only little knowledge about other algal groups previous to this course. The Freshwater Algae course broadened my phycological training and even allowed me to better understand diatoms. I am confident this training will give me a competitive edge for future research positions. Furthermore, I am using the knowledge I gained from this course to instruct public outreach and education programs in phycology. Ana collecting Aphanizomenon in Lower Gar Lake. The Hannah T. Croasdale Fellowship allowed me to participate in the Freshwater Algae course at Iowa Lakeside Laboratory in Milford, Iowa during the summer of 2013. This course was invaluable to my dissertation research. My work focuses on triggers and maintenance of cyanobacteria dominance in eutrophic lakes. Over the past two years, I have collected several thousand phytoplankton samples that I am in the process of identifying and quantifying. The course allowed me to develop a large image library of commonly occurring genera, verify identifications for a subset of my own samples, and learn standard methods of quantification and biomass estimation. I gained a broad understanding of characteristic algal morphological structures and their function, allowing me to accurately key and identify unknown taxa. Since the course, I have applied these tools to developing new undergraduate laboratory curriculum as a Freshwater Ecology teaching assistant at Iowa State University. Finally, I gained a fantastic network of phycological friends and contacts that I hope to maintain throughout my academic career. Rosemary ready to do some quadrat sampling in the field. The Hannah T. Croasdale Fellowship allowed me to attend the 2013 Marine Algae course at Friday Harbor Laboratories. Over 5 weeks of intensive study I learned; collection, identification, and culture techniques for both micro- and macroalgae. Our class project focused on comparisons between Ulva found growing on rock and Ulva growing epiphytically on other macroalgae. This project helped me better understand morphological and cytological traits used in Ulva identification and to apply molecular techniques to confirm my identifications. Part of my dissertation research focuses on identifying Ulva propagules in water samples. Under the guidance of experts in algal taxonomy, I was able to test out species identification methods that I intend to use for Ulva propagule identification in my research.